I have just received an e-mail as a member of Bradford Playhouse, from the Playhouse, but I have not meet or talked to any of the people sending the latter or described as taking action on the Playhouse’s behalf. It is not good news, but I do not know how it will affect my ‘Pie, Priestley & Playhouse Night; until I talk to the people I have dealt with at the Playhouse. Mistakes in ticketing meant I had a day in London today, with no plan. I ended up drinking beer in Clerkenwell. Landlords at the Horseshoe and the Betsy Trotwood (both called Richard) asked about my shows, especially the ‘Little Britton Festival (celebrating Thomas Britton, the musical coalman of Clerkenwell Green). Yesterday walked to school friend Tony Bailey’s 50th birthday party north of Hailsham in East Sussex. The journey started with a walk to the station and trains to Polegate. It rained a little on the way but the only rain after that was whilst I was in a pub. 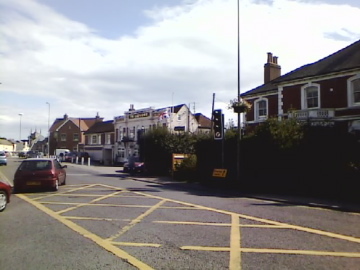 First pub was the Dinkum in Polegate. Like the two that came after it was a Harvey’s of Lewes pub with only Best on handpump. I have never been a fan but it was drinkable enough. 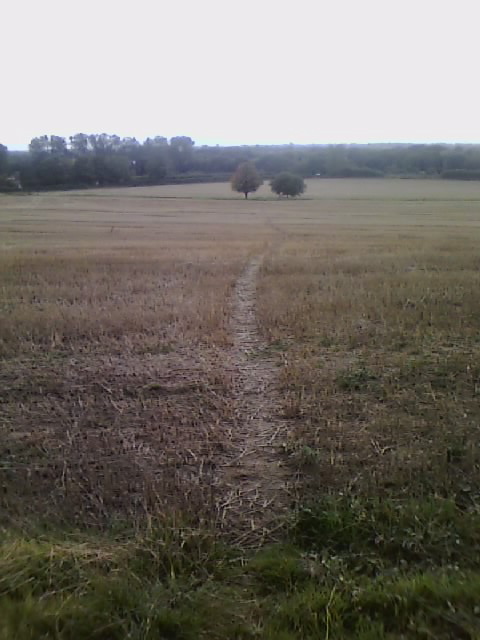 I walked along a track called the Cuckoo Trail which follows the route of a disused railway. The 3 mile part between Polegate and Hailsham was quite busy with plenty of friendly dogs. Its easy walking but the trees and bushes either side mean not many views this time of year. Some flowers and birds but I imagine there would be much more to see in spring and maybe winter with the trees leafless. 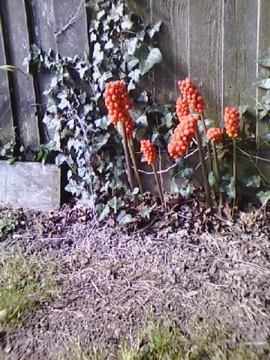 There were lots of cuckoo pint berries. 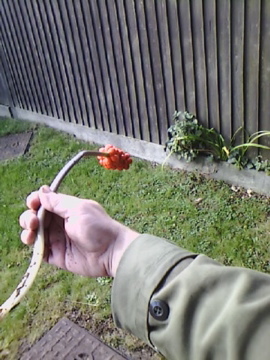 and fling your arm forward keeping hold of the stalk. 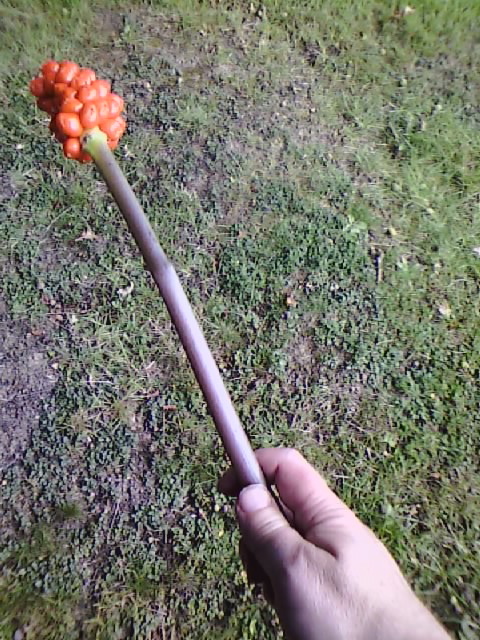 The berries shoot off at high speed and can go a dozen metres; ensuring there will be even more cuckoo pints next year. 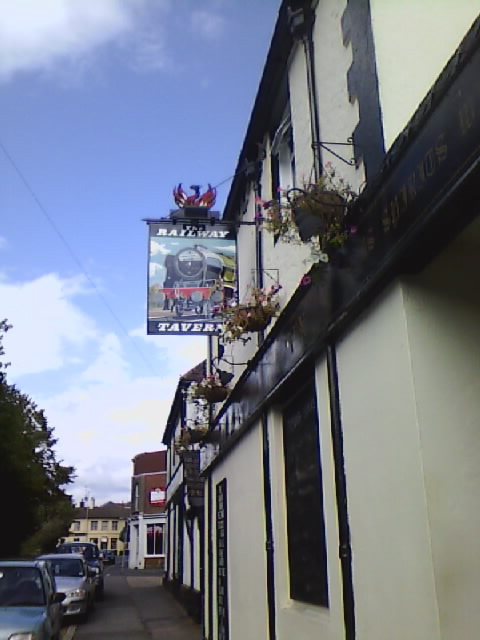 Next pub was the Railway in Halisham. Friendly, as was the Grenadier, I got people talking and many them laugh. I had a half and half in the last one; this is a tradition of mixing half a bitter with either half a mild (once very common in West Yorkshire and Sussex) or a bottle of other beer. I chose a bottle of Elizabethan because I had not had it for many years, forgetting it is over 8%. The second half of the walk was mostly off the Cuckoo Trail, though before I left it I passed an apple tree with massive red apples that were sweet and tart and one of the best I have ever eaten. 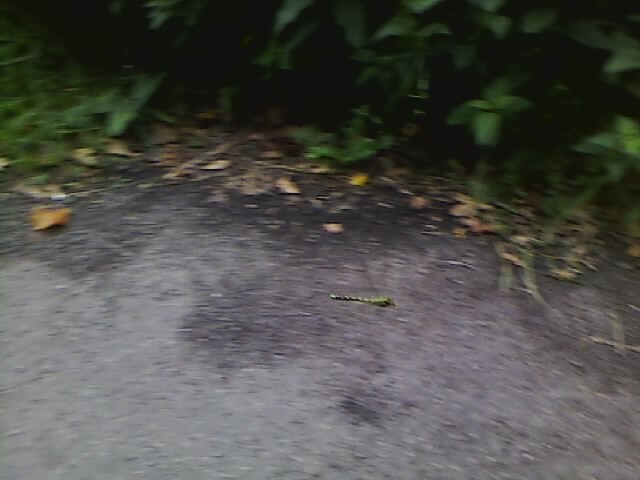 That was followed by a big, green dragonfly. Off the trail I passed a private pond and then a carpet tile left on grass. I picked it up and found a slow worm, a snake like lizard. I passed lots of tiles, obviously part of a programme. 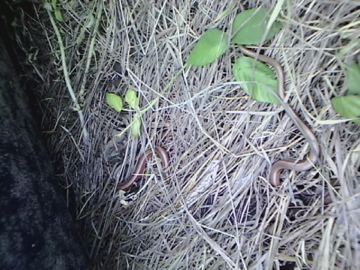 I saw 8 slow worms altogether, mostly very small, All but the first one just lay still as I looked, I then put the tile back. I walked across a recently harvested wheat field and gleaned some wheat, picking up left behind ears of corn. If it is ripe you can rub it between your hands, blow off the chaff and eat the corn. Went with the apple and blackberries eaten earlier. The last stretch was alone the road. A mile before the party I passed a table by the road with a couple of bunches of runner beans for sale, with a note to put the money through the letterbox. 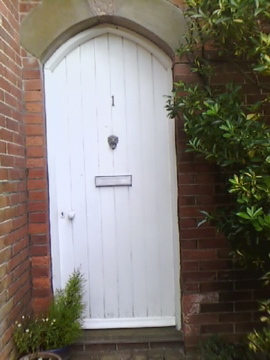 I am not a great fan of runner beans but like to encourage enterprise, so i put the money through this letterbox. The lady of the house, Pat, came out to talk to me. It turned out her husband, Brian, is always talking bout Tony, and Pat could not believe he was 50. She also presented me with the other bunch of beans as a present for him. 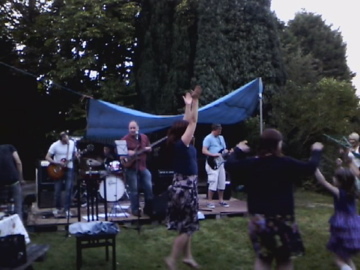 Got to Tony’s house It was a grand party, with Tony playing in bands. There were six of us from Thomas Bennett Comprehensive School: me; Tony and Hugh (who have kept contact); Russ Barnard (who I have not seen for at least 15 years; Sorrel Clement (15 years) and Mark Hailer (30 years). i hardly talked to Tony because he was so busy but talked loads with the rest. It was really good but also strange, or interesting rather, talking about a shared past with folk I had not seen for decades. Both for what was said and the different ways we remembered; some having not thought about it much and others seemingly still seemingly living there. I should write more about the party and the people.It was a great party, but like the walk, this blog is probably getting a bit tiring. I wanted to go to the British Film Institute showing of A Month in the Country yesterday, but it would have been too much after the day before and the days to come. It is a shame, especially as the producer of the film. Kenith Trodd (I was at this event and get a name check at the end), wrote to tell me about the showing. On the other hand there was no event attached as it was part of a tribute season to the screenwriter Simon Gray, who I talked to at the last but one showing of AMitC. The truth is that the stuff I did about AMitC and J.L.Carr (who wrote the novel the film was based on) all seems a long time ago. The film is now on youtube, which lessens the need for a re-release of the DVD, and doing a new, Carr linked, show has lacked both urge and opportunity; and I must have both. Not going meant I could do more cider making. The stuff I started last week is making more gas than even I can manage. I also went looking for another 2nd hand ipod at the shop where I bought ma’s; it being much cheaper than e-bay. I was not surprised that they had none. I keep trying to get wordpress to publish this blog automatically on facebook, and the box is ticked, but a message from Mark Neale shows that it is not happening, at least for him. If you are reading this on facebook please message me. This is doubly annoying as all blogs get posted on twitter, no problem. Read Music at Night, a play by J.B.Priestly. Finally sorted the contract out for the Pie, Priestley and Playhouse Night. Got a National Express coach. Saw a fire extinguisher next to a lorry with a wheel covered in form. Discovered the coach to be a wonderful home for an ipod. Got off at Marble Arch and discovered two new pubs: the Devonshire Arms on Duke Street and one I did not look at the name of, but might have been the Coachmakers, Had a long conversation about Bob Harris and country music. Walked to the Albert Hall, saw a stump of a rainbow from Hyde Park. Saw Mahler’s 6th from the top Prom (balcony?). Not been to a Prom since the year I went to Poland, which was probably a decade ago. It is still only a fiver. 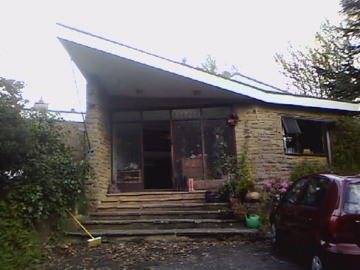 Went down to Bradford Playhouse today to hammer out more details about my show on 13th Sept. I ended up mopping the floor with the technical manager, or rather: together with the technical manager, because someone had left the tap running. It is like I had never been away. It looks like the show may be partly on the main stage. I went to Leeds yesterday and came back without drinking any beer! Went to see Anzir about computers. A great help, as always.